Donald Bruce Hermann was born June 5, 1947 in Newark and grew up in Chatham. Don’s father had a homebuilding and renovation business, and Don was pressed into service after school to help out. He joined the football team at Chatham High in order to avoid this and found that his size and agility made him a good running back. Don continued his football career as a walk-on at Waynesburg College, an NAIA school an hour south of Pittsburgh with a good sports program. Don’s teammates there included lineman Joe Righetti, who played in the NFL for the Cleveland Browns, Dave Smith, who played for the Steelers, and running back Rich Dahar, who earned All-America recognition despite playing for a small school. Righetti would later become Don’s brother-in-law. His younger brothers Wayne and Glenn also played football for Waynesburg. In 1966, Don’s sophomore season, Waynesburg won the NAIA national championship with an undefeated 11–0 season. Their crowning victory was a 42–41 thriller over Wisconsin-Whitewater in the title game. They reached that game with a win over New Mexico Highlands in the final minute. Waynesburg’s charmed season featured five victories in the final seconds, including a victory over West Virginia Wesleyan in which Don reeled in the deciding TD pass with 46 seconds left. In Don’s final two college seasons, the Yellow Jackets only lost three games. In 1967, Waynesburg beat Frostburg State 81–0. In 1968, Don scored 7 touchdowns in a single game against Lock Haven. After a standout career as a receiver at Waynesburg, Don was drafted in 1969 by the New York Giants in the 15th round. The team drafted another receiver, Rich Houston, 11 rounds earlier, so Don figured he was headed for their minor league team on Long Island. But his sure hands and willingness to catch balls in traffic earned him a starting slot as the Giants’ flanker, and he became a favorite target of Fran Tarkenton, who connected with Don 33 times his rookie year. 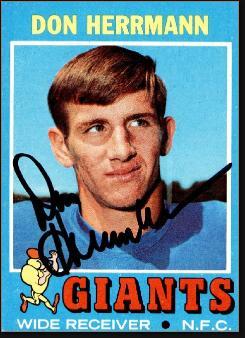 Don had one of the great Opening Days of any Giants rookie when he caught a pair of fourth-quarter TD passes in a 24–23 comeback win over the Minnesota Vikings—who went on to win the NFL Championship that year. On an offense featuring the likes of Homer Jones, Clifton McNeil, Bob Tucker, Joe Morrison and Bob Grim, Don was rarely the primary target. However, he was usually good for three or four catches a game until 1974, when a knee injury cost him almost half the season. The Giants cut him in 1975 after he hurt his leg in preseason and he caught on with the Saints in December. He recovered to have two solid years in 1976 and 1977 before calling it a career. Don’s final NFL season was Archie Manning’s first. They connected 32 times for more than 400 yards. Don played in 100 NFL games and caught 234 passes for 3,039 yards. He scored 16 touchdowns. After football, he got into the family business he'd avoided as a teenager, homebuilding and renovation.